Adding a sub output is not the kind of work I usually do. However, I decided to give it a shot. 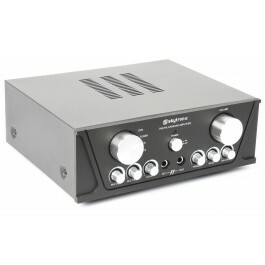 The item to work with is a Skytronic karaoke amplifier. 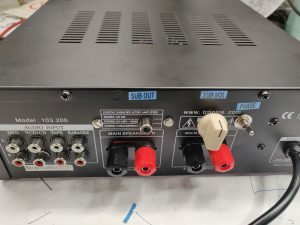 So I simply tapped the signal after the volume pot and attached it to the active subwoofer circuit I used, I found inspiration from this circuit. 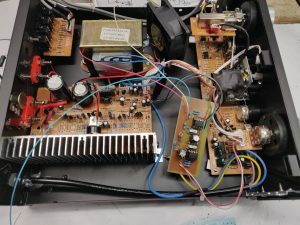 Since the amplifier already had +/- 12VDC supply I did not have to use a dedicated power supply for it. I also changed the output terminals for the speakers as requested by customer. Here’s a view from the back, with some new stuff.